Tim Hortons Should switch to Earth cups!! * Earth Cup™ is made from renewable resources, is 100% compost able and petroleum free, all which make this cup very earth friendly. * Most hot cups are coated with Low Density Polyethylene (LDPE), a petrochemical plastic. LDPE is non-renewable and non-compostable, making the only methods of disposal; litter, land fills or incineration. Earth Cup™ is coated with earth friendly bio based material that uses less energy and significantly less greenhouse gas footprint. * Earth Cup™ meets the ASTM 6400 composting standard and is acceptable at over 45 composting facilities in North America. * Earth Cup™ can be coated one side for hot cups and two sided for cold beverages. o Earth Cup™ hot cups are suitable for hot coffee, tea and other hot beverages. o Earth Cup™ 9 oz water cups are coated on both sides and are suitable for water, soda and other chilled beverages. 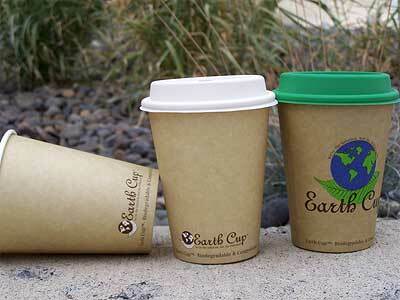 * Earth Cup™ hot cups stock sizes are 10, 12, 16 and 20 oz. o 24 oz cups will be available in December. * Custom print using either flexo or off set print is available hosting up to five colors using soy based inks (minimum order is 50,000 per size). Kandle HeeterToday is a cold, wet dreary day. Which inspired me to dig the Kandle Heeter out of the garage. Parked next to my mouse, this little device brings the temperature of my 8×12 office up from shivery to cozy – not quite enough to take my lovely handknit wool socks off, but a great antidote against a dreary January, and a definite cat magnet. How it works: That top terracotta pot is actually a nest of several, spaced with metal bolts. Heat rises from the candle and then absorbs into the ceramic, which is a high ‘thermal lag’ material. High thermal lag materials are dense and heavy – tile, concrete, water – all of these store heat well. The pots won’t hold it forever, but they concentrate it, slowing down its exodus to the ceiling. They keep the heat near my mouse hand – which definitely increases my productivity! The developer says a 3″ dia. 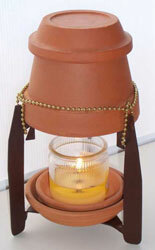 by 3″ ‘dollar store’ candle will yield about 50 BTUs an hour, for a total of 1000 BTU. I get about two days per candle, so that’s 0.50/day. If all my winter days were wet, cold, and in need of paraffin cheer (sum total of mid-Dec thru March = 105 days), that’s about $50 for a heating season. And it smells nice. Granted, I live in mostly sunny Northwest Florida, so my heating bill is pretty small compared with snowy places. But this one with the silly name is one of those ‘value added’ ideas – if I’m going to burn a Christmas gift candle, I may as well get full value. (Check out their other nifty ideas: using an incandescent light bulb instead of a candle, and other open-architecture common-sense energy concepts. These LED tubes fit into a T8 fluorescent fixture. The brightness is similar to a 40W T8 bulb, but ours uses 14W of electricity. You save 26W per bulb. Now times that with every fluorescent light in your building and the KW savings is staggering. We can offer a beautiful warm white color that will be almost the same as an incandescent (Edison) bulb. These tubes will last about 17 years if used 8 hours a day. The savings is normally between 70-85% on electricity. There is no hazardous waste. Based on $0.06 kwh, 4-foot, 40W fluorescent tube x 80,000 hours/the lifespan of the LED light.1 small store with 60 lights would save over $10,000! The Return on Investment for either of these solutions is less than one year. The ongoing “tree-sit” protest to stop construction of an athletic training center on the U.C. Berkeley campus finally came to a conclusion on September 9, 2008, when the last tree-sitters came down from the one remaining tree. The scene attracted a huge crowd of sympathizers, detractors, onlookers and media. A recent legal ruling had cleared the way for the university to begin construction after a seemingly interminable series of delays which lasted over a year and a half. 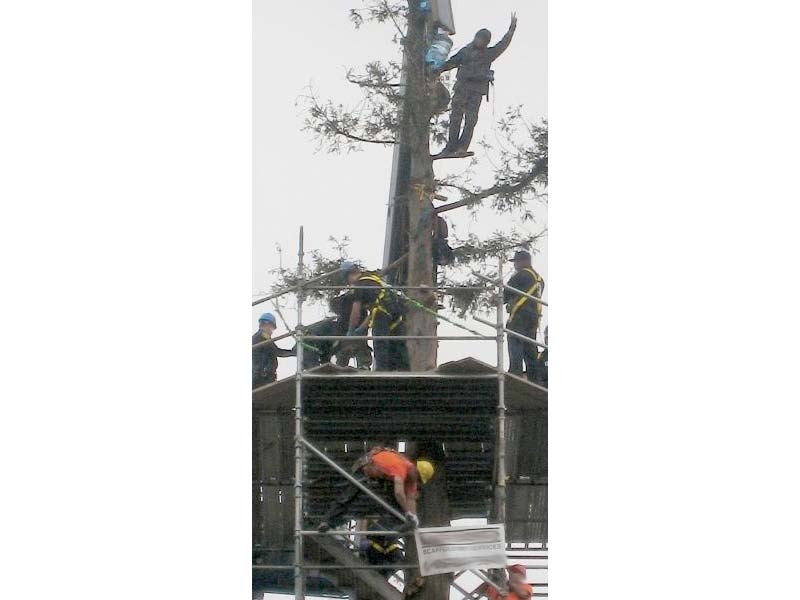 Within hours of the ruling, campus work crews felled all but two of the disputed trees which had occupied the work site — one that was to be transplanted elsewhere, and the other (a redwood) which housed the last four tree-sitters. A few days later, on September 9, after negotiations failed to convince them to come down of their own accord, the police had no choice but to bring them down whether they liked it or not. The stage was set for the final act. Check out http://www.zombietime.com/berkeley_tree-sit_finally_ends for the full story.